Congratulations to the winners - Brittany, Camilla, and Courtney! About a year ago I featured pretty holiday creations by Helle Holst of Stjernestunder in Denmark... folded stars and woven hearts and cones. Now Helle has teamed up with Hana Vyoralová of Prague to produce a new line of stylish pleated paper stars. The design is as unique as it is beautiful! Helle told me that even though she has always made all items with her own hands, she realized she had reached her limit of producing/folding and was longing to try lots of other things "in this wonderful paper world." Helle began to look for someone to help with production and knew when she met Hana online that she had found a special person who shares her paper passion and creativity. This new Pleat model with twelve points is Hana's design, yet the entire process has been one of collaboration and cooperation. Helle chose the slightly metallic paper colors which are, she says, even more beautiful in person and very popular in Scandinavia... white, grey, black, and copper, and also carefully selected the string, eye, and final packaging. The stars are constructed in three sizes. The smallest is nearly 3 inches (74 mm) in diameter, medium is 3.3 inches (86 mm), and the largest is 4.2 inches (106 mm). 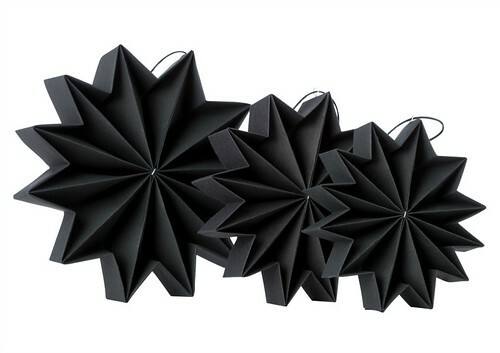 Helle has offered to send 2 boxes of pleated stars to 3 winners worldwide. Please note that a box contains three stars of one color, one of each size. (To clarify: each winner will receive six stars total. They may all be one color or choose two colors.) Each box has a retail value of approximately $23 USD, thus this giveaway equals a generous total of $46 per winner. Helle and Hana are already busy working on a new pleat model for spring! 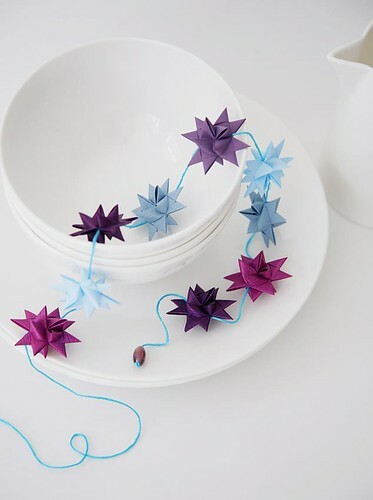 Here's a look at Helle's traditional folded stars in beautiful shades of purple and blue. To enter the giveaway, simply leave a comment on this post. Be sure to include your email address or another way to be contacted within your comment. The giveaway will end on Sunday night, November 10. The winners will be selected by a random number generator and announced on this page as soon as they have been contacted. Good luck! Note: this is a sponsored giveaway. I would love to win this beautiful creations! Very striking! Thanks Ann for another give away! The stars are lovely. Would love to win. Thanks for the opportunity, Ann! oh these are gorgeous. I'm always fascinated by folded items. So intriguing. Have a great day and thanks for the opportunity of winning some. These stars are so beautiful in their simplicity. As a quiller, I love reading your blog and seeing all of the interesting things people are doing with paper. Cheers! I'd love to be entered into the drawing. delightful! I'd love some to hang in my window, my daughter things our house needs to be more "fancy." Oh my gosh... beautiful! Would love to win some stars! 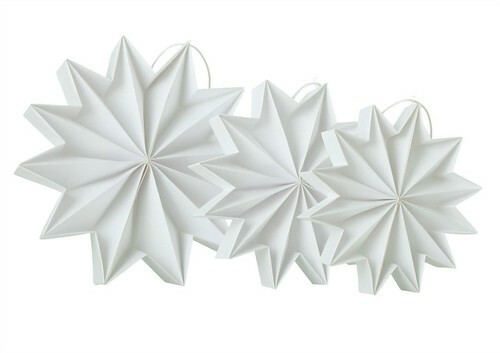 I am already planning my Christmas decor and these stars would be the perfect addition! They're beautiful! And how kind to have a drawing as well. Oh yes.. I would like these stars! This is amazing, I am fascinated! My brain is spinning - HOW does she fold those? They are AWESOME!!! Oh yes please, I need these! these are beautiful! I would love them for the nursery! I just love those beautiful ornaments! I've have worked with many different mediums of paper, it's in my blood! Absolutely stunning! These stars are so beautifully and expertly folded, such works of art! I'd LOVE to nab some stars of my own, please count in me in for the giveaway! My email is robyn.mitchell@gmail.com. Thanks for an amazingly wonderful giveaway! What a great star design. Perfect for the holidays. oh, wow, these stars are immaculate and would make great center pieces for Christmas decoration! Oh wow, these are amazing! So immaculate and clean, and in very good colours too! Belles étoiles. Merci, Ann, de nous faire découvrir de si jolie choses. Would love to wine these beautiful stare. The traditional folded stars are so beautiful. These paper stars are beautiful and I would love to win some! These are such beautiful pieces of paper art. I would love to own some. Those are stunning! I can't even believe they are pleated. These ladies have a fabulous collaboration going. I wish them tremendous luck in their future projects. As for me, I'd sure like to show these off in my home! These stars are beautiful! Thanks for the chance to win. Stunning. What a great addition for the holidays. I've never seen stars like these pleated stars--they're beautiful. And while I've made the stars at the end of the post, I never thought to make them in these delicious colors. Great idea. The stars are so beautiful!! They would look gorgeous on a tree. Thanks for the chance to win. One word GORGEOUS!!!!! Thank you for the opportunity to win something so beautiful. What a wonderful giveaway. Those are truly unique. Diannemu22@hotmail.com: Since I am disabled and can't work, the internet has offered me so much joy in seeing other people's creativity and outstanding designs in so many mediums. I love paper so much and these items are works of art. Just gorgeous! I'd love to win! This would be a lovely addition to any ones Holiday Decorations. I would love to be entered in the giveaway! these look awesome! Thanks for sharing! they are awesome! These are elegant! I know how hard it is to fold this way and make it so crisp! Talented two! I love the German Stars at the bottom. These are so simply elegant. I would love to see them in person! Please enter me at nicolie88@yahoo.com. I would cherish any of these if I was lucky to receive them - how ever they came into my home. They are exquisite - elegant. These stars are beautiful, simply beautiful. I would enjoy them very much, in a broadly arched doorway, occasionally gently moved by heat currents from the wood stove. A bundle of stars...the moon and Mars! I am very fascinated with paper art; these pleated stars are awesome looking! Oh, I would love to win these stars! They are practically twinkling! The blue and lilac look so lovely together. Those are so pretty! I would love a set for my small apt. I love the gray and copper. I think they would look great together. I have never seen stars like these before - they are amazing. Beautiful stars :) I´d love to win this! Thank you to all of you for all the nice comments. The gifts will be send tomorrow by the Danish Post system. A Little early - We wish you a Merry Christmas and a happy New Year.